This exceptional shoulder bag is hand-crafted by Chirada Loetparisanyu with quality cotton and dark brown leather. 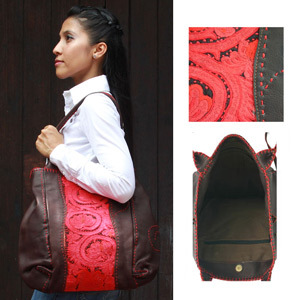 Its exterior is adorned with vibrant red embroidery and stitching done by hill-tribe women's expert hands. 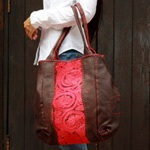 The generous interior is lined in cotton, and features four inner pockets, one for cell phone and two with zipper. There is an external pocket in the back. The bag itself closes with a magnetic clasp button or by tying the leather strings over the top to give the bag a different shape. Feminine yet practical, this large shoulder bag will lend an ethnic touch to any wardrobe.